1. How much does UK house insurance cost? 2. How much is buildings insurance? 3. How much is contents insurance? 5. What factors could have affected home insurance premium trends? 6. What factors affect the cost of my home insurance premium? 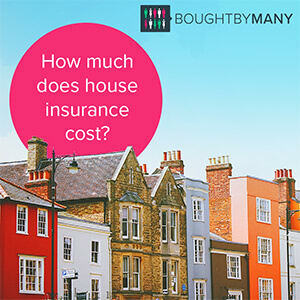 Home > News & Resources > How much does house insurance cost? The average cost of home insurance in the UK is £163, based on data published from the second quarter of 2018, by the AA's British insurance premium index. This is 3.8% higher than the year before. However, you could pay more or less than that depending on your circumstances. You might even be able to get a discount on your policy with some of them. For example, M&S Bank offers up to 20% off home insurance if you buy online. Below we've looked at the average cost of home insurance in the UK based on two differing reports, as well as the factors that influence the cost of insuring your house. How much does UK house insurance cost? The average premium for combined buildings and contents insurance in the second three months of 2018 was £163, based on data published by the AA's British insurance premium index. This equates to £13.60 a month; up by 1% on the previous quarter and up 3.8% over the previous year. In contrast, in the first three months of 2017, the average buildings insurance premium was £263, based on data from ABI down by 2% on the previous quarter and up by 3% on the previous year. The average contents policy was down by 1% on the previous year to £135. Looking at data from ABI for the previous two years, average house insurance cost was slightly higher in 2016 at £306 a year, 2015 at £308 a year. In 2014 it was noticeably lower at £291 for an annual policy. In the final quarter of 2016, combined home insurance rose 3.5%, due to the increase in insurance premium tax (IPT). The overall trend seems to be that home insurance premiums have gone up slightly over the last few years. The ABI report is based on information from insurers that are ABI members. They say these members cover 90% of the insurance market and therefore offer a good indicator of average prices for buildings, contents and combined house insurance cover. The AA report is based on 750 quotes from 54 insurers, brokers and schemes. It uses a method called the AA Shoparound index. This is an average of the five cheapest premiums quoted from a broker, the direct market and price comparison sites. It uses a 'nationwide basket of risks' it says is representative of the market, meaning it can accurately track quarterly price. The difference in how ABI and the AA collect data may account for the discrepancy in results. According to the AA, the average cost of buildings insurance policy in the first quarter of 2018 was £161.47 an increase of 3.8% on the last quarter of 2017; and an increase of 1% on the previous quarter of 2018. The average contents insurance policy was priced at £59.69, equating to a decrease of 1.7% compared to the same quarter in 2017. According to the same AA report, London and South saw the biggest premium increase in the second quarter of 2018: costs went up by 1.3% to £175.77. The cheapest region to insure is the West and the West Country, with the average price at £151. The most expensive area was London and the South East, with an average premium of £175.77. In the second quarter of 2018, premiums for those aged 17 to 22 have gone down by 1% to £168.40; and premiums for those aged 70 and above have gone up by 1.5% to £138.27. What factors could have affected home insurance premium trends? According to the AA report, several factors could have influenced the slight rise in the price of home insurance over the years. This includes uncertainty over the impact of Brexit, which resulted in a weaker pound. The increase in Insurance Premium Tax by 10% in October 2016 may also have contributed to fluctuating home insurance prices. In 2017, the Insurance Premium Tax saw a further increase of 3.5%. From 1 June 2018, the increased rate came into effect for all home insurance premiums - new or existing. What factors affect the cost of my house insurance premium? The policy you choose There are generally three types of home insurance policy: buildings, contents, and combined buildings and contents. Each will cost varying amounts depending on the cover levels you set. Generally, a combined house insurance policy is the most expensive of the three. Your excess level Lots of insurers will let you set your own voluntary excess. This is usually on top of any compulsory excess the insurer has set. While a higher excess can bring down the cost of your house insurance, remember that if you do have to make a claim you will have to pay this amount, so make sure it's affordable. Any optional extras you need This can include laptops, expensive bicycles, or any other valuable items that need more than a £1,000 individual item limit (this is usually the standard individual item limit). Some insurers may also offer cover for items you take outside of the house on a regular basis, as well as accidental damage insurance. Your claims history If you've made a claim in the past, some insurers may not be able to insure you, or your premium may be higher. Read our article on getting home insurance if you've been refused cover here for more information. Where you live Your postcode will affect the cost of your home insurance. High-risk areas - for things like flooding, for instance - and supposedly 'wealthier' areas - such as London and the South East - will generally have higher premiums than other areas of the country. The type of property Whether your home is a house, flat, bungalow, townhouse, bedsit or maisonette will make a difference to your premium. How large the house is This is usually judged on the number of rooms, including bedrooms, bathrooms, living rooms or lounges and kitchens. Whether the house is listed Whether or not the building is a Grade 1 or 2 listed, or under preservation order, will affect the cost of your home insurance premium. Generally listed buildings, having been deemed of special interest, will cost more to insure. Read our article on home insurance for listed buildings for more information on this. How you use your home If you use your home for business, your premium may be more expensive. You may not be covered to practise your business under a standard home insurance policy. You may have to purchase a separate business insurance policy. If you're looking for specific business insurance, check out our groups for business and professional insurance. The age of the property Older buildings can sometimes garner higher average house insurance premiums as it can be more likely that something goes wrong. However, newer buildings, which may be more expensive to fix, can also have expensive premiums. Some insurers offer home emergency cover for any unexpected breakdowns, such as boiler repairs. This may be useful for some older buildings. Read our guide to home emergency policies for more information. The roof Insurers may charge higher premiums or even not insure your house if your roof is totally, or even partially, flat. This is because flat roofs have a higher risk of water damage. Insurers may ask you what percentage of your roof is flat - up to 25%, 25% to 50%, or more than 50%. The materials used to build the property Most houses are made of brick walls and tiled roofs. However, if your house is made of different materials, you have to inform your insurer, and this could affect the price of your premium. Whether the house is in a good state of repair Whether your house has had to have its foundation reinforced had any history of flooding, shows any signs of subsidence or has suffered from tree damage may increase the cost of your house insurance. The government launched their Flood Re scheme in 2016, which can offer cheap insurance for those living in areas at high risk of flood. Read our article on Flood Re for more information. The security of the building Insurers usually look favourably on any increased insurance measures, as they can lower the risk of theft. These include the locks you have on your doors (5 lever mortice deadlocks are standard), the type and number of entrances to the property, whether the windows have locks, and whether or not there is a burglar alarm. Insurers will also look at how long, if at all, your house is left unoccupied for. If your house is occupied all day and all night, your home insurance premium may be lower than if it is left unoccupied for long stretches of time. Moreover, insurers generally will not be able to insure your property if it is left unoccupied for longer than 30 days, though some will stretch their limit to 60 or 90 days. Check out our article on unoccupied home insurance for more information on this.